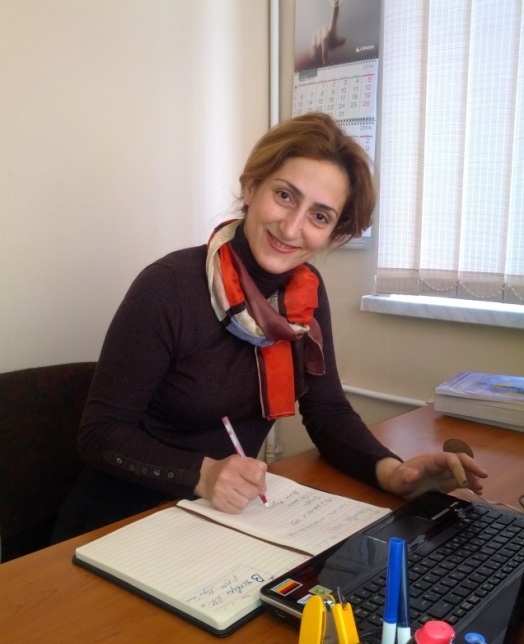 Ms. Syuzanna Juharyan joined the Nakashian Children’s Support Center in Yerevan in February of 2014, to carry out the responsibility of the management and the overall implementation of the Center’s programs, ensuring inclusiveness of the interventions and the responses to the needs of the beneficiaries. Ms. Juharyan holds a Master of Science degree in Social Work and Social Administration from Moscow School of Social and Economic Sciences, and a BA degree in Sociology from Yerevan State University (YSU). She currently serves as a faculty member at the Department of Sociology at the YSU, teaching case management, social group work, and history of social work. Prior to joining Mer Hooys, Ms. Juharyan worked with Fund for Armenian Relief and Children’s Support Center Foundation (FAR Children’s Support Center),serving as an Expert in Development and Implementation of Integrative Social Services in Armenia.“My mission at Mer Hooys is to bring the girls to an understanding that life creates obstacles and opportunities at the same time, and it is their choice on which of them to rely and go forward”, remarked Ms. Juharyan. “Through the assistance of our multidisciplinary team, the girls can develop into self-controlled, self-confident, all-round educated young women and responsible citizens. We are grateful to AIWA-SF for providing educational opportunities to our girls in developing English and computer skills. Our ongoing and future plans are targeted to promote higher education, participation in diverse historical and cultural events, social and educational training’s and help the girls shape their future”. “My mission at Mer Hooys is to bring the girls to an understanding that life creates obstacles and opportunities at the same time, and it is their choice on which of them to rely and go forward”, remarked Ms. Juharyan. “Through the assistance of our multidisciplinary team, the girls can develop into self-controlled, self-confident, all-round educated young women and responsible citizens. We are grateful to AIWA-SF for providing educational opportunities to our girls in developing English and computer skills. Our ongoing and future plans are targeted to promote higher education, participation in diverse historical and cultural events, social and educational training’s and help the girls to shape their future.